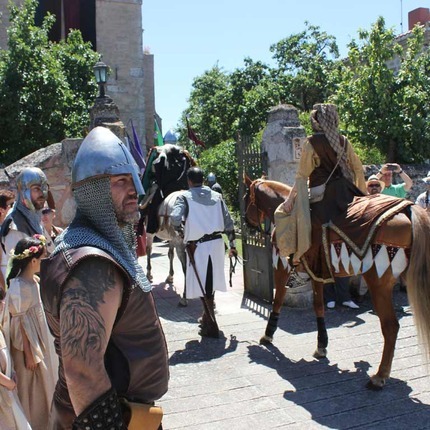 The neighbors of Vivar del Cid (Burgos), considered by many the homeland of the warrior, remember their favorite son with a festival that takes place in the first weekend closest to July 10, date in which it is believed the death of Rodrigo in Valencia, in the year 1099. For more than two decades, the Association "Vivar Cuna del Cid" focuses its efforts on organizing various activities such as parades, musical performances, and a tribute to the eight flags belonging to the provinces that are part of the Camino del Cid. But the most important act is the presentation of the Tizona, the most emotional event, in which a replica of the famous sword of El Cid is handed to that collective, institution or personality related with the knowledge or promotion of El Cid. When: Weekend closest to July 10.